Why begin a course on classical dynamics with a statics example? 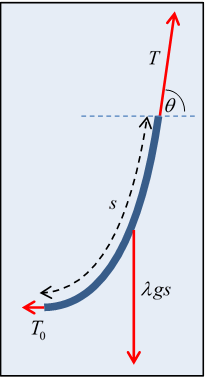 The reason is that the most important underlying principle of classical dynamics, and much of the rest of physics, is Hamilton’s Principle of Least Action: a system’s time development can always be describes as a path through some multidimensional parameter space (positions, velocities of all its component parts) and the path it actually follows is the one that (on varying the path) minimizes the integral of a certain function, called the action, along that path. A generalization of this principle by Dirac and Feynman (the "sum over paths") led to a fruitful reformulation of quantum mechanics and quantum field theory, now widely used. The mathematical machinery necessary to minimize an integral along a path by varying the path is called the calculus of variations, so that’s what we have to master. To see how it works, we’ll first apply it to a simple example: finding the curve describing a uniform rope hanging between two points under gravity. The “action” for this statics problem is of course just the potential energy. And, to be sure we’ve found the right answer, we’ll first solve the problem by more traditional statics techniques. So this is where we begin. What is the shape of a chain of small links hanging under gravity from two fixed points (one not directly below the other)? The word catenary (Latin for chain) was coined as a description for this curve by none other than Thomas Jefferson! Despite the image the word brings to mind of a chain of links, the word catenary is actually defined as the curve the chain approaches in the limit of taking smaller and smaller links, keeping the length of the chain constant. In other words, it describes a hanging rope. A real chain of identical rigid links is then a sort of discretization of the catenary. We're going to analyze this problem as an introduction to the calculus of variations. First, we're going to solve it by a method you already know and love -- just (mentally) adding up the forces on one segment of the rope. The tension is pulling at both ends, the segment's weight acts downwards. Since it's at rest, these three forces must add to zero. We'll show that writing down the balance of forces equation gives sufficient information to find the curve of the chain , meaning height above ground as a function of horizontal position . So we understand the mechanics of the problem. that shall be absolutely straight. Let's take the hint and look first at a piece of uniform string at rest under high tension between two points at the same height, so that it's almost horizontal. 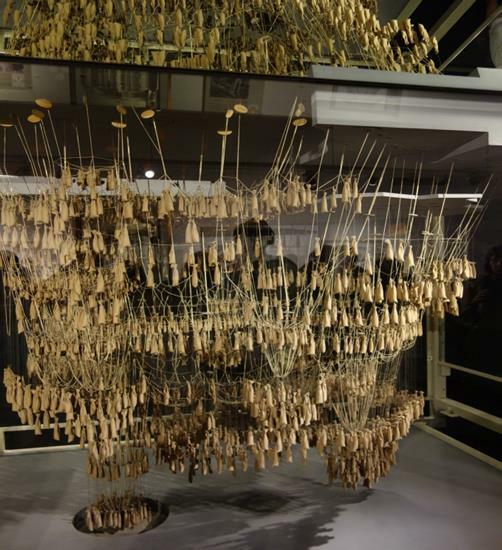 Each little bit of the string is in static equilibrium, so the forces on it balance. First, its weight acting downwards is , being the uniform mass per unit length. Second, the tension forces at the two ends don't quite balance because of the small change in slope. so , and , taking the lowest point of the string as the origin. So the curve is a parabola. However, there are hidden approximations in the above analysis -- for one thing, we've assumed that the length of string between and is but it's really where the distance parameter is measured along the string. Second, we took the tension to be nonvarying. That's a pretty good approximation for a string that's almost horizontal, but think about a string a meter long hanging between two points 5 cm apart, and it becomes obvious that both these approximations are only good for a near-horizontal string. Obviously, with the string nearly vertical, the tension is balancing the weight of string below it, and must be close to zero at the bottom, increasing approximately linearly with height. Not to mention, it's clear that this is no parabola, the two sides are very close to parallel near the top. The constant approximation is evidently no good -- but Whewell solved this problem exactly, back in the 1830's. What he did was to work with the static equilibrium equation for a finite length of string, one end at the bottom. where we have introduced the constant which sets the length scale of the problem. So we now have an equation for the catenary, in terms of distance along the string. What we want, though is an equation for vertical position in terms of horizontal position the function for the chain. choosing the origin at , which makes . But of course what we want is the curve shape , not . We need to eliminate in favor of That is, we need to write as a function of , then substitute . We've dropped the possible constant of integration, which is just the vertical positioning of the origin. Question: is this the same as the curve of the chain in a suspension bridge? Now let's consider some upside-down curves, arches. Start with a Roman arch, an upside-down U. Typically, Roman arches are found in sets like this, but let's consider one free standing arch. Assume it's made of blocks having the same cross-section throughout. What is the force between neighboring blocks? We'll do an upside-down version of the chain force analysis we just did. 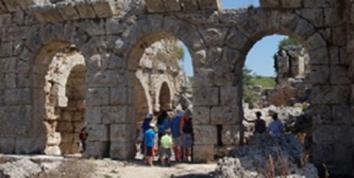 A single Roman arch like this is therefore not an ideal design -- it could fall apart sideways. Let's define an ideal arch as one that doesn't have a tendency to fall apart sideways, outward or inward. 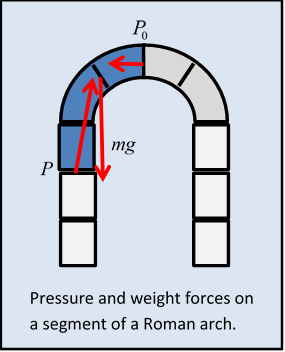 This means no shear (sideways) stress between blocks, and that means the pressure force between blocks in contact is a normal force -- it acts along the line of the arch. That should sound familiar! For a hanging string, obviously the tension acts along the line of the string. Adding to our ideal arch definition that the blocks have the same mass per unit length along the entire arch, you can perhaps see that the static force balance for the arch is identical to that for the uniform hanging string, except that everything's reversed -- the tension is now pressure, the whole thing is upside down. Nevertheless, apart from the signs, the equations are mathematically identical, and the ideal arch shape is a catenary. Of course, some actual constructed arches, like the famous one in St. Louis, do not have uniform mass per unit length (It's thicker at the bottom) so the curve deviates somewhat from the ideal arch catenary. 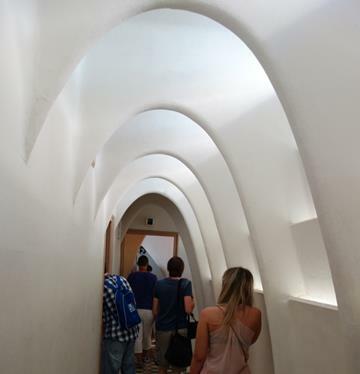 Here's a picture of catenary arches -- these arches are in Barcelona, in a house designed by the architect Gaudi.